As I mentioned in Medical Instrumentation, first 5 chapters, for the past few days, I’ve been slogging through one of the potential text books for the circuits course: Medical Instrumentation: Application and Design, 4th Edition. John G. Webster. Publisher: Wiley, 2009. # ISBN-10: 0471676004; # ISBN-13: 978-0471676003. 2-page intro about why amplifiers are needed and why input impedance needs to be at least 100 MΩ and gain around 1000. Explains need for bipolar signals and for fixed, calibrated gain. Explains how the 10 wires (4 limb wires and 6 chest wires) produce the 12 standard signals of the standard 12-lead EKG. Talks about the heart as a varying electrical dipole, and how the 12 leads provide 60 degree spacing of vectors in 2 different planes. Defines “Wilson’s central terminal” and explains how it can be used to get differential signals to get 6 directions out of the 4 limb wires. Gives block diagram of a typical EKG. Discusses the need for protection circuitry and ability for EKG to recover quickly from defibrillation shocks. This section looks very valuable for our EKG lab. Discusses many of the problems of EKG design (and, to a lesser extent, EEG design) caused by large transients, ground loops, and capacitive couple of 60Hz noise. Again, an excellent section for students to read for the EKG lab. Describes shielding and driven-right-leg system. The driven-right-leg system has a lower effective resistance for the ground electrode than connecting the leg to ground, by feeding back the common-mode signal. 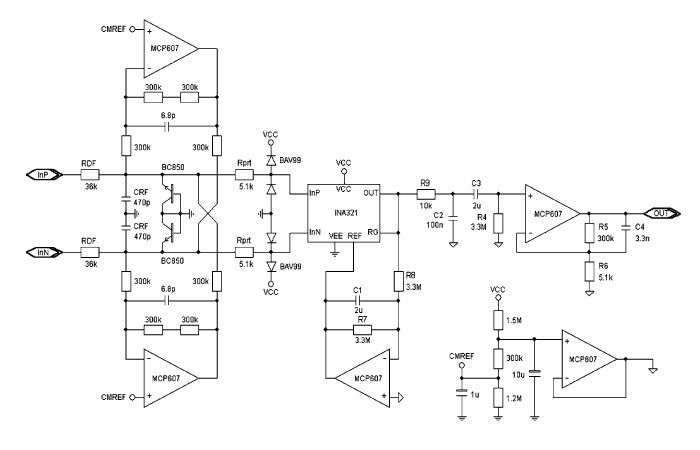 Because the ina126p instrumentation amplifier does not provide a common-mode output, this approach is not available to us. Figure 6.16 gives frequency and voltage ranges for EOG, EEG, ECG, EMG, and AAP (axon action potential) amplifiers. EMG amplifiers need higher frequency response than ECG (but not as much low frequency response). Glass micropipette electrodes may need negative-input-capacitance (positive feedback) amplifiers. EEGs, because of small differential signals and high gain may need very high CMRR (example give needs 112 dB). Gives the circuit for an EKG preamp, using op amps. Does not mention the difficulty of matching resistors accurately. Does discuss saturation caused by DC offsets (hence the need for small gain), hi-pass filtering after the differential amplifier, and low-pass filter in the final stage. Also has a shorting switch for recentering the stage after the high-pass filter after a transient that moves it out of the linear region. The discussion of the design could be useful for our EKG lab, though the details will be different for the student design, since they’ll use a single-chip instrumentation amp and 1 resistor instead of 3 op amps and 7 resistors. that looks interesting. It sticks a cross-coupled feedback stage in front of an instrumentation amp, to get a low common-mode impedance with a high differential mode impedance. I’m a bit dubious of the need for frequencies below about 0.1 Hz. Heartbeats only go down to about 0.46 Hz for a healthy human, though rates as low as 0.16Hz have been reported in the medical literature (in a patient who died within 12 hours). Still, one doesn’t need the DC component of that waveform, and the interesting parts of the waveform are of much shorter duration. Note: bradycardia is often diagnosed at <60bpm (1Hz) and extreme bradycardia is diagnosed at <40bpm (0.67 Hz), though my resting rate is 42–52bpm (0.7–0.87 Hz)—a low heart rate that I believe I inherited from my father. The described technique for the cardiotachometer seems quaint, using counters and registers, even though they say that “software calculates v_o”—the design obviously dates from the days when A-to-D conversion was expensive (say 25 years ago). Nowadays, the whole thing would be done in software, with just enough analog amplification and filtering to make the signal suitable for input to an A-to-D input of a microprocessor. The digital integration for the EMG makes more sense, though I wonder whether RMS makes more sense than mean absolute value. Signal averaging is introduced for evoked potentials (examples given for EEG or ERG signals, as well as fetal EKG). Other ways of separating fetal EKG from maternal EKG are discussed. Vector cardiographs are mentioned, but rather dismissively. They say that cardiac monitors typically have a bandwith of 0.67–40Hz, rather than the ?–150 Hz of diagnostic EKGs described in Section 6.2, the 0.01–250 Hz of Table 1.1, or the 0.01–100Hz mentioned by Dobrev. It seems that there is quite a range of different ideas about what part of the waveform needs to be preserved. Discussion includes the advantages of implantable monitors (like the Medtronics Reveal implantable cardiac monitor). Block diagrams for lead fall-off alarms are also included. Very brief mention of telemetry, and even briefer mention of modern methods (like ZigBee and BlueTooth). I still don’t think that we can make Medical Instrumentation our main text book, but I like a lot of Chapter 6 (particularly when combined with the better parts of Chapters 4 and 5). I think we’re going to have to extract and boil down the most useful material, though, as there is a bit too much and the useful details are too scattered to have the students go on a treasure hunt for it in the limited time that library reserves circulate for. Writing the handout for the EKG lab is going to be a massive undertaking—almost a book chapter on how EKGs work.